The contemporary census builds geographic data from blocks, block groups, and census tracts. In the Nineteenth Century the smallest unit for which data can be readily tabulated is the Enumeration District (ED). They are comparable in population size to census tracts. The Minnesota Population Center offers a useful summary of historical enumeration procedures. Enumerators, who were charged with visiting every home and hand-entering information onto forms, were for the first time directly trained and supervised by the Census Office. Although this change did not remove politics from the execution of the census, 1880 is widely viewed as year of the first “professional” census. The practical function of the ED in 1880 was to define the area within which a given enumerator was contracted to gather data. A written description of the boundaries has survived for much of the country, in the form of a listing of enumerators, the payment owed to them, and the area for which they were responsible (see the illustration of one page from the St. Louis record). Unfortunately they often do not have very clear boundaries. District Supervisors were chosen for their familiarity with their region, and when defining enumeration districts they provided only enough information to guide the census taker, who was also a resident familiar with the area. The result is descriptions that occasionally include prominent, but idiosyncratic features. Examples include fences between houses (Chicago), obsolete political boundaries (St. Louis’s former city limit, and ward boundaries), minor water features that have since moved underground (many locations), shorelines that have been radically changed through infill or dredging, alleys, and hill crests. One recurring problem is the use of an outdated or informal name for features that are crucial for defining the limits of a boundary. Another common problem is a boundary described as following an extension of a street until it reaches the city limits, which is problematic if that street never existed or was extended in a different direction after 1880. 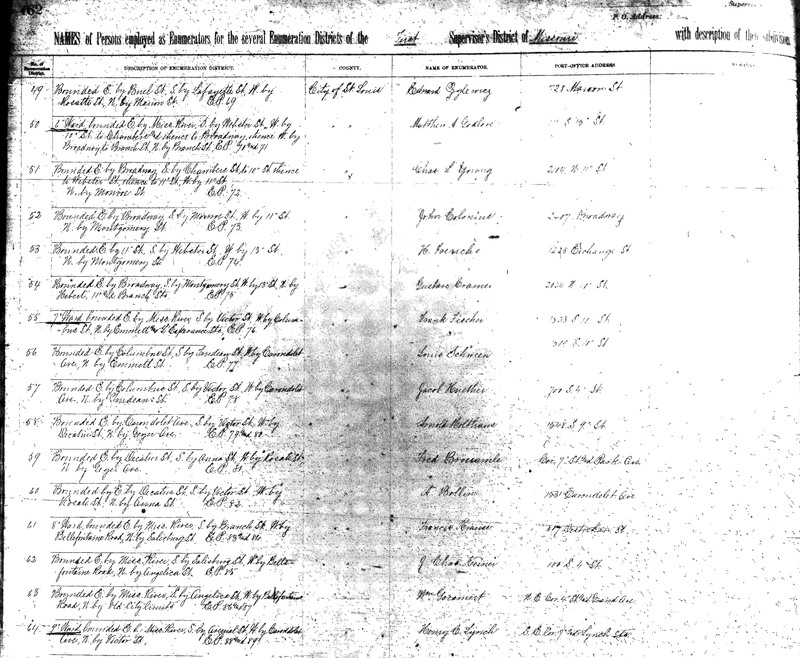 A greater problem is that the Census Office’s records of ED boundaries in 1880 are incomplete. 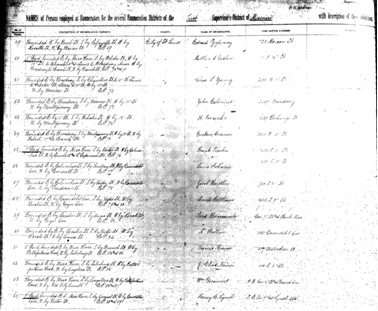 No records remain for Alabama, Arizona Territory, Arkansas, California, Colorado, Connecticut, Montana Territory, Ohio, Oregon, Pennsylvania, and Wisconsin. In many other cases (such as New Jersey) EDs in major cities are described as portions of precincts (e.g., Precinct 5 north of Main Street) that are undefined in the descriptions. The Urban Transition Project provides maps of EDs in two forms. The first is directly tied to a historical street map from the period, and this is the form employed in our web-based GIS maps. Here the boundaries of EDs have been drawn along the streets of the historical map, like an annotation. Information about the population composition of EDs is provided as an additional layer on top of this map. 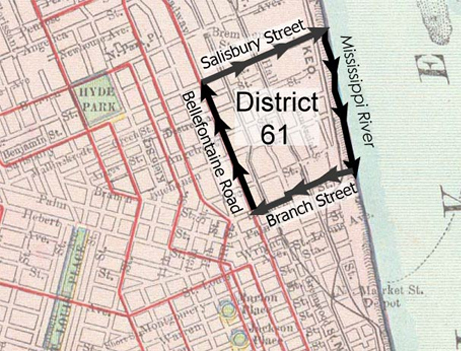 This form allows the user to see the city as it was represented by a 19th Century cartographer, with street names and other features clearly labeled, as in the illustration of District 61 in St. Louis. However, even though we have modified the map through georeferencing, the image is not an accurate projection. The second form of the boundary file is based on the contemporary TIGER files that we have edited in order to make them conform more closely to the 1880 city. These files provide enumeration district boundaries and all street features in a way that is as accurate as possible. When individual addresses are geocoded to this map, their coordinates will be the most reliable that can be achieved with our current information. These are the maps that should be downloaded and used for detailed spatial analyses. However there is always something lost in translation. In this case, for example, we have not been able to adjust the land area of cities to take into account landfill or rechanneling of waterways over the last 130 years.